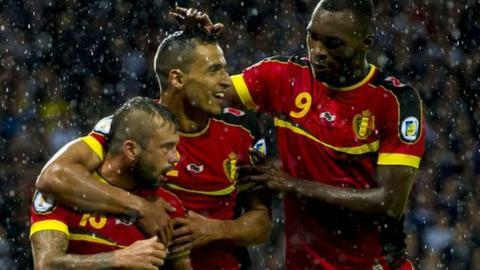 Belgium recorded a repeat of their victory in Brussels, with Scotland unable to cope with their power and technique. Steven Defour put the visitors ahead before the interval with a deftly-taken goal from the edge of the penalty area. Scott Brown and Shaun Maloney went closest for Scotland, but keeper Thibaut Courtois was rarely troubled. Kevin Mirallas wrapped up the win in the closing minutes, to the delight of the travelling support inside Hampden. It means their side sit five points clear of Croatia at the top of Group A, while Gordon Strachan's men lie ignominiously bottom and desperately need to win in Macedonia on Tuesday to avoid further despair. This Belgium side, of course, is one on the brink of potential greatness, with an array of talent few other countries in the world can rival. Such is their ability on the ball, Strachan would surely have preached to his players the importance of keeping possession, so when Steven Whittaker's control let him down deep inside his own half it was no surprise the punishment was severe. Marouane Fellaini, imperious in his first match since his deadline-day move from Everton to Manchester United, picked up and drove forward before sliding the ball wide right to Kevin De Bruyne. The Chelsea winger's first-time ball picked out Defour, who clipped a shot past the sprawling Marshall. The second Belgium goal was made in the English Premier League. Aston Villa's Christian Benteke, otherwise kept pretty quiet by Scotland's central defence, was allowed to turn and feed the ball to the substitute Mirallas of Everton and he easily slipped away from Grant Hanley to make the points safe for Marc Wilmots' side. Belgium's unbeaten record and position at the top of the group never looked threatened but the Scots twice came within inches of beating Courtois in the visitors' goal. The Scotland captain Brown fizzed a powerful drive just past the keeper's right-hand post from about 25 yards in the hosts' only real effort of the first period. And in the second half, Maloney stretched to get on the end of a terrific delivery from the left by the substitute and debutant Ikechi Anya, only for the ball to fly agonisingly wide. The gulf between the sides was marked, in contrast to the 2001 World Cup qualifier at Hampden when Scotland were devastated to draw 2-2. But despite their dominance of the match, it took the Belgians almost half-an-hour to force a save from Marshall. When it came, it was a pretty rudimentary one. With Russell Martin and Whittaker back-pedalling furiously, space opened up for De Bruyne who used Fellaini's run as a decoy, but his attempt from 20 yards was comfortably held by the goalkeeper. The only other serious action before the break for Marshall was to keep out a dipping Axel Witsel volley. De Bruyne peppered Marshall's goal from distance throughout, but it wasn't until the dying minutes that the Belgian victory was assured. The Belgians are clearly Brazil-bound. The Scots will only be able to watch in envy.